LONDON, England (CNN) -- An overcast, chilly summer day failed to stem the excitement and pride of Olympic officials and athletes as they showed off their progress three years ahead of the 2012 Games. "I'm delighted," said Sebastian Coe, the chairman of the London 2012 Olympic Committee. "We are exactly where we would want to be at this moment." Coe wore a hard hat and fluorescent yellow vest as he took journalists, officials, and athletes on a tour of the Olympic Stadium three years to the day before the London Games begin. Construction vehicles rumbled on the muddy center that, in three years' time, will be the stage for the Opening Ceremony. Blog: Three years to go ... much to be done. "We have to have this ready, tested, and brimming full of excitement by 12 minutes past 8 three years from today, Coe said. That time, of course, translates to 20:12 on the clock, when the ceremony will begin. Half a dozen cranes tower over the stadium, which is still an oval concrete shell without seats. No distinctive architectural features are yet visible, though officials promise that by Games time, the stadium will be decorated with a unique wraparound electronic design. 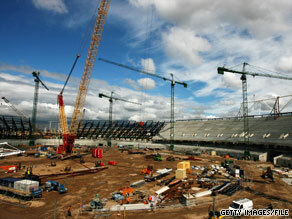 The stadium will hold 80,000 people when it's complete. After the Games, officials plan to remove the top tier of seats and leave 25,000. "What's happened in some other (Olympic host cities) is that they've just not found a use for an 80,000-seat stadium," said John Armitt, chairman of the Olympic Delivery Authority (ODA), the publicly funded body that is in charge of building the venues. "We have a lot of big stadia in London and we don't need at the moment another 80,000-seat stadium." The Olympic Stadium will eventually be turned into a venue for world-class athletic events as well as community use. "It can hold the biggest of the athletics events at 25,000," Armitt said. Monday's celebration of the three-year mark was more of a progress report than an unveiling. The theme of the day, repeated by Olympic and government officials, was that the Olympics are on time and on budget. There seem to be no major issues with Olympic funding so far. The London Olympic Committee -- known by its acronym, LOCOG -- is privately funded with a budget of £2 billion ($3.3 billion). Most of that money is coming from Olympic sponsorship, with some also from the International Olympic Committee. The ODA is entirely publicly funded, with a budget of £9.325 billion ($15.4 billion). The taxpayers are footing most of that bill, but some money is also coming from the National Lottery. A plan to secure private funding for two ODA projects, the Olympic Village and the press center, dried up amid the credit crunch. That forced the ODA to dip into a contingency fund of public money in order to complete the projects. London Mayor Boris Johnson acknowledged that the recession has made some things like the funding of the village and the press center more difficult. "But what it has done is it's helped with labor costs, clearly, and some of the commodity costs have not been as high," Johnson told CNN. "So there have been savings that the Olympic Delivery Authority has found and I congratulate them on it." Using contingency funds to complete the two projects won't jeopardize the ODA's budget, Johnson said, promising to "be ruthless" in making sure it doesn't happen. The International Olympic Committee has praised the progress of the Games so far. Coe attributed that success to good planning that began during London's Olympic bid, when it already secured planning permission for some projects. "This is the product of really forensic and detailed planning (and) some really focused teams," he said. Also running on time Monday was the first scheduled trip of the new high-speed train service between central London and the Olympic Park. The dedicated train speeds at 140 miles an hour, making the trip in seven minutes. The "Javelin" train will eventually be able to carry some 95,000 people an hour to and from the park, officials say. A select few Olympic and Paralympic athletes were able to see the park for the first time Monday, including some of the venues where they may be competing in 2012. British diver Tom Daley, 15 -- who won gold at last week's diving world championships in Rome -- was able to see the aquatics center, where swimming and diving events will be held. It is still under construction but its curving roof is already visible not far from the stadium. "Every time you come here you get the Olympic buzz, and it really gives you the extra inspiration to come here and try to get here to compete in three years' time," Daley told CNN. "I'm really excited about the Olympic Games because they're going to be in my home country. The British people are going to go mad. And everyone's going to come together, and everyone's going to feel as a team and everyone's going to get into the Olympic spirit."